Actors often complain about being typecasted by Hollywood. But the people who really complain are the agents, managers and accountants of the actors who have been typecasted into edgy characters in smaller budget movies. Think of Johnny Depp, Robert Downey Jr and Nicolas Cage. They were doing fine with memorable careers in the ’90s. But at the same time, they weren’t pulling in the mega-million dollar gigs like certain superstars who couldn’t even convincingly read the menu at a Planet Hollywood opening. So this trio did their best to shed their quirky ways to become the next generation of monster paycheck superstars. Cage made his transformation right after he won his Oscar with The Rock. He took well to playing the normal guy in the midst of the giant budget mayhem. This lead to him getting to play the lead in the 8MM which featured a script that cost over a million bucks from the guy who wrote Se7en. In a film about going deep into the underbelly of filmmaking, Cage had to play the kinda family guy who would be repulsed and not an avid fan. Tom Welles (Nicolas Cage) is a private detective who gets a high profile client that needs a low profile investigation. After the wealthy and powerful man dies, his widow (Myra Carter) discovers an 8mm film in the safe. Turns out it’s not a home movie from one of their vacations. It’s a girl being killed on camera by a guy in a black leather mask. She wants to know why her husband had this film and is it real. She’s worried about the girl in the movie. She’s willing to pay big bucks and informs her lawyer (The Silence of the Lambs‘ Anthony Heald) to pay Welles handsomely. This leads to Welles hitting the road to discover the identity of the girl. He has to leave behind his wife (Capote‘s Catherine Keener) and their kid. After days searching missing children data banks, he gets a facial match. He heads to Fayetteville, North Carolina to find out more. You know that moment when a movie does takes a false step that makes want to go Twitter to scream at a director (if they have a Twitter account)? In 8MM, the visit to Fayetteville was my throwing down the gloves to Joel Schumacher. Being someone who lives about an hour drive from the city (near Fort Bragg), I can assure you that the gritty, hilly town with a massive river is not Fayetteville. That must be somewhere in Pennsylvania. Joel Schumacher knows better than this. For 99 percent of the viewing public, this doesn’t matter. But this was just lameness on the screen including the crappy I-95 North and South entry ramp sign stuck up against a building. The movie was made after North Carolina became a film hotbed with Blue Velvet and King Kong Lives being made around there. Schumacher could have easily sent a crew up from Wilmington to get real B-roll of the area. Or he could have just called it somewhere in Pennsylvania. Although I pointed out, this misstep will only throw off locals so don’t let it ruin your enjoyment. Welles does realize he found the girl in the films and confirmation that she went out to Los Angeles from a meeting with her old boyfriend (The Walking Dead‘s Norman Reedus). This leads him into poking around all the creepy adult stores in town. He gets assistance from punk store clerk Max California (Gladiator‘s Joaquin Phoenix). Welles learns quickly that there’s a lot of sick and twisted people looking for video of sick and twisted things. Although nobody is openly dealing snuff. Eventually he gets a good enough lead to make him suspect slimeball producer Eddie Poole (The Sopranos‘ James Gandolfini) and Gonzo director Dino Velvet (Fargo‘s Peter Stormare) were part of making the 8mm. 8MM takes us back to a time before the internet changed it all for the adult video industry. The creepy swap meets that Cage visits must now be replaced with a Deep Web sharing site. Although he’d miss all the strange odors and fear of touching things that appear moist. There’s almost a nostalgia to the piece that probably shouldn’t be there. At least we’re not treated to a 10 minute diatribe from Gandolfini about how free streaming services are killing his business model. Cages is very restrained playing Welles. While there’s talk of how his investigation will change him, he doesn’t flip out and rival Stormare in wackiness. 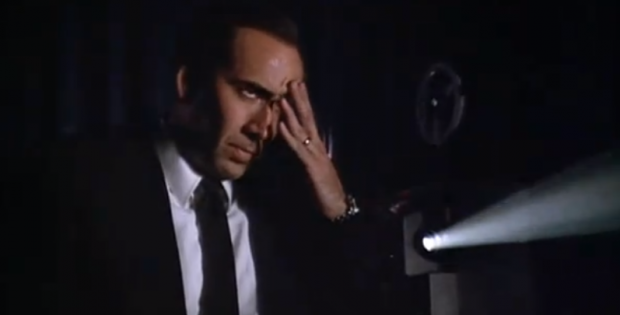 Cage plays the film like he’s Alan Ladd investigating to see if there was a crime. He does his best to keep his character normal. Fayetteville aside, 8MM is my favorite Cage as the uptight guy flick. Part of this comes from getting to see the other supporting actors play such greasy characters. Chris Bauer, the King of HBO, even pops up before he took off in The Wire, True Blood and The Deuce. At the end of the film, you’ll probably want to take a shower. The video is 2.35:1 anamorphic. The resolution brings out the creepiness of all the places Welles has to visit. You can make out a few more details in the darkness and squirm in your seat. The audio is 5.1 DTS-HD MA. The mix makes things feel extra sketchy when Welles visits the “flea markets” of VHS tape vendors. The movie is subtitled. 8MM In 35MM (21:08) is a recent interview With Producer/Director Joel Schumacher. He talks about not wanting to do John Grisham’s Runaway Jury. He wanted to do a film that wasn’t a summer blockbuster. He took 8MM because he wanted to do something edgy. He had already cast Russell Crowe as Welles when Nic Cage called to say he wanted the part. There was a major difference in potential budget and the studio wanted Nic. He talks about the restraint Cage wanted to use in the role. Joel praises Living In Oblivion. At this point, my admiration for Joel Schumacher has grown. I will forgive him for Fayetteville. Audio Commentary with Producer/Director Joel Schumacher gets deep into the production and the actors. Vintage Behind The Scenes Featurette (5:07) places the film as a descent into Hell. Nic talks a lot about the role. Theatrical Trailer (2:35) shows Welles wanting to get a higher level of clients if he can crack this case. But the case might crack him. TV Spots (1:04) nothing could prepare Welles for what he must do. Still Gallery (6:39) are pictures and promotional material from the release. Scream Factory presents 8MM. Directed by Joel Schumacher. Screenplay by: Andrew Kevin Walker. Starring: Nicolas Cage, Joaquin Phoenix, James Gandolfini, Peter Stormare, Anthony Heald, Chris Bauer and Catherine Keener. Rated: R. Running Time: 123 minutes. Released: January 8, 2018.